Strains in�Jarro-Dophilus EPS� promote healthy intestinal microflora, which in turn helps to support intestinal health and immune function. *Bifidobacteria Iongum�BB536 has been clinically shown to stimulate immune response and promote healthy intestinal microfloral balance.*L. rhamnosus�R0011 is a unique, high producer of polysaccharides that facilitate colonization and stimulate intestinal immune response.*L. helveticus�R0052 assists in breaking down lactose (milk sugar), which may improve digestion of dairy products by those individuals who are lactose intolerant. *�Lactococcus�and�Pediococcus�help reduce spoilage caused by unfriendly bacteria in fermented foods. Help maintain your daily digestive health and optimal intestinal balance with dairy-free Chewable Acidophilus. Acidophilus helps to stimulate the beneficial bacteria in the digestive and intestinal tracts, encourages proper nutrient absorption, and promotes immune health. Beneficial bacteria can be altered by many factors including the taking of antibiotics Acidophilus is the ideal way to enhance our positive flora. Our 100% naturally delicious banana flavored, milk-free chewable acidophilus is ideal for those who are lactose-intolerant. Each wafer contains a mix of two classic lactobacilii - acidophilus and bifidum - and is guaranteed to deliver 1 billion microorganisms per serving. With Chewable Acidophilus, you can support your digestive health and feel good all day...every day. Supports Digestive and Intestinal Health. Acidophilus supports the healthy functioning of the intestinal system by promoting a favorable environment for the absorption of nutrients. Help maintain your daily digestive health and optimal intestinal balance with liquid milk-based Probiotic Acidophilus. Acidophilus helps to stimulate the growth of beneficial bacteria in the digestive and intestinal tracts, encourages proper nutrient absorption and promotes overall immune health. Beneficial bacteria can be altered by many factors including the taking of antibiotics. Acidophilus is an ideal way to enhance our positive flora. American Health liquid probiotics provide a perfect way to supplement naturally with acidophilus - they are formulated with a high microorganism concentration level per serving and are easy to ingest. Each serving delivers 20 billion hardy cultures of three specially selected strains of Lactobacillus including L.acidophilus, L. bulgaricus (the original Metchnikoff strain) and a strain from the Pasteur Institute, in a yogurt-like base of predigested milk solids. With American Health� liquid probiotic acidophilus, you can support your digestive health and feel good all day...every day. Help maintain your daily digestive health and optimal intestinal balance with liquid milk-based Probiotic Acidophilus. Acidophilus helps to stimulate the growth of beneficial bacteria in the digestive and intestinal tracts, encourages proper nutrient absorption and promotes overall immune health. Beneficial bacteria can be altered by many factors including the taking of antibiotics. Acidophilus is an ideal way to enhance our positive flora. American Health� liquid probiotics provide a perfect way to supplement naturally with acidophilus - they are formulated with a high microorganism concentration level per serving and are easy to ingest. Each serving delivers 20 billion hardy cultures^ of three specially selected strains of Lactobacillus including L.acidophilus, L. bulgaricus (the original Metchnikoff strain) and a strain from the Pasteur Institute, in a yogurt-like base of predigested milk solids. With American Health� liquid probiotic acidophilus, you can support your digestive health and feel good all day...every day. Help maintain your daily digestive health and optimal intestinal balance with liquid milk-based Probiotic Acidophilus. Acidophilus helps to stimulate the growth of beneficial bacteria in the digestive and intestinal tracts, encourages proper nutrient absorption and promotes overall immune health. Beneficial bacteria can be altered by many factors including the taking of antibiotics. Acidophilus is an ideal way to enhance our positive flora. American Health� liquid probiotics provide a perfect way to supplement naturally with acidophilus - they are formulated with a high microorganism concentration level per serving and are easy to ingest. Each serving delivers 20 billion hardy cultures^ of three specially selected strains of Lactobacillus including L.acidophilus, L. bulgaricus (the original Metchnikoff strain) and a strain from the Pasteur Institute, in a yogurt-like base of predigested milk solids. With American Health� liquid probiotic acidophilus, you can support your digestive health and feel good all day...every day. Help maintain your daily digestive health and optimal intestinal balance with liquid milk-based Probiotic Acidophilus. Acidophilus helps to stimulate the growth of beneficial bacteria in the digestive and intestinal tracts, encourages proper nutrient absorption and promotes overall immune health. Beneficial bacteria can be altered by many factors including the taking of antibiotics. Acidophilus is an ideal way to enhance our positive flora. American Health� liquid probiotics provide a perfect way to supplement naturally with acidophilus - they are formulated with a high microorganism concentration level per serving and are easy to ingest. Each serving delivers 20 billion hardy cultures^ of three specially selected strains of Lactobacillus including L.acidophilus, L. bulgaricus (the original Metchnikoff strain) and a strain from the Pasteur Institute, in a yogurt-like base of predigested milk solids. With American Health� liquid probiotic acidophilus, you can support your digestive health and feel good all day...every day. This NOW product has been designed to provide a high potency, balanced blend of the two prominent species of resident intestinal bacteria. Regular intake of beneficial probiotics can aid in maintaining healthy intestinal flora. * Jarro-Dophilus� �+ �FOS �survives stomach acid and colonizes the intestines. * FOS is a natural fiber that enhances the growth of beneficial probiotic bacteria. * Each capsule contains 3.4 billion total probiotic bacteria. � Bifidus Balance� +?FOS�survives stomach acid and colonizes the intestines. * FOS is a natural fiber that enhances the growth of beneficial probiotic bacteria. * Each capsule contains 5 billion total probiotic bacteria. Jarro-Dophilus�+ �FOS �survives stomach acid �and colonizes the intestines. * FOS is a natural fiber �that enhances the growth of beneficial probiotic �bacteria. * Each capsule contains 3.4 billion total probiotic bacteria. Get answers from an expert. For product information please contact our nutritionists at Sundrops.com. Supports Digestive and Intestinal Health. Acidophilus supports the healthy functioning of the intestinal system by promoting a favorable environment for the absorption of nutrients. Enzyme Probiotic Complex is an advanced, dual-action formula delivering multi-level digestive and nutrient absorption benefits in both the stomach (enzymes) and intestinal tract (probiotics). This complex is specially formulated to help support the body's natural digestive process, delivering a broad spectrum of enzyme activity for more thorough protein, fat and carbohydrate breakdown. Enzyme Probiotic Complex provides the essential foundation you need for efficient digestion and gastric wellness. Enzyme Probiotic Complex contains 9 distinct, naturally-based protein, carbohydrate and fat-digesting enzymes. Enzymes help break down protein into amino acids, carbohydrates into simple sugars and fats into fatty acids that your body absorbs as nutrients for energy needs and cell growth. If protein, carbohydrates and fats are not properly digested as they pass through the stomach, they may be broken down by the bacteria in the gastro-intestinal tract, which could cause you to feel unsettled and out of balance,due to inefficient digestion. The addition of 2 billion bio-active probiotic organisms from 5 beneficial cultures supports microbial balance of healthy intestinal flora and contributes to the healthy functioning of the immune system. They help promote absorption of nutrients, further supporting digestive health. Everyone's digestion issues are different. Now you can have the best of both worlds...enzymes AND probiotics in one convenient, vegetarian formula. Enzyme Probiotic Complex is the ideal choice for those individuals looking for a superior level of dual nutritional benefits to help maintain more thorough and efficient digestion. 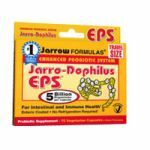 Strains in�Jarro-Dophilus EPS� promote healthy intestinal microflora, which in turn helps to support intestinal health and immune function. *Bifidobacteria Iongum�BB536 has been clinically shown to stimulate immune response and promote healthy intestinal microfloral balance.*L. rhamnosus�R0011 is a unique, high producer of polysaccharides that facilitate colonization and stimulate intestinal immune response.*L. helveticus�R0052 assists in breaking down lactose (milk sugar), which may improve digestion of dairy products by those individuals who are lactose intolerant. *�Lactococcus�and�Pediococcus�help reduce spoilage caused by unfriendly bacteria in fermented foods. Probiotic CD� is a proprietary blend of 12 billion^ bio-active microorganisms from 10 naturally-derived vegetarian cultures. Specially formulated with a patented technology called BIO-tract�, this exclusive gel matrix creates a protective layer around the tablet as it travels through the digestive tract. BIO-tract��shields active organisms from stomach gastric acids, directing them to release in the gastrointestinal tract where food nutrients are more readily absorbed. Without BIO-tract��stomach gastric acids may destroy sensitive bacteria before they reach the intestinal tract - reducing the number of active organisms, lowering product effectiveness and impacting nutrient absorption. In a once daily dose, Probiotic CD��s controlled delivery system gradually releases organisms over an extended period of time throughout the entire gastrointestinal tract. As microorganisms are released steadily through the protective gel layer, they continue to attach to specific sites in the gut where they are most beneficial. Controlled delivery ensures that the organisms remain active at consistent levels, providing balanced microorganism absorption and true potency. This represents a unique difference when compared to enteric-coated or non enteric-coated probiotics, which either release all probiotic microorganisms at one time or offer no protection from a harsh stomach environment. Once daily Probiotic CD� delivers the all day digestive, intestinal and immune system support you can count on to feel good, hour after hour. Get answers from an expert. For product information please contact our nutritionists at Sundrops.com. Strains in�Jarro-Dophilus EPS� promote healthy intestinal microflora, which in turn helps to support intestinal health and immune function. *Bifidobacteria Iongum�BB536 has been clinically shown to stimulate immune response and promote healthy intestinal microfloral balance.*L. rhamnosus�R0011 is a unique, high producer of polysaccharides that facilitate colonization and stimulate intestinal immune response.*L. helveticus�R0052 assists in breaking down lactose (milk sugar), which may improve digestion of dairy products by those individuals who are lactose intolerant. *�Lactococcus�and�Pediococcus�help reduce spoilage caused by unfriendly bacteria in fermented foods. Get answers from an expert. For product information please contact our nutritionists at Sundrops.com.